41mm x 9.80mm stainless steel case, sapphire crystal back, screw-locked crown, glareproofed sapphire crystal, black dial with grande tapisserie pattern, gold applied hour-markers with luminescent coating, and gold Royal Oak hands with luminescent coating , self-winding Audemars Piguet Calibre 3120 movement with date and large seconds, approximately 60 hours of power reserve, stainless steel bracelet. Water resistant to 50 meters. 41mm x 9.80mm stainless steel case, sapphire crystal back, screw-locked crown, glareproofed sapphire crystal, silver dial with grande tapisserie pattern, gold applied hour-markers with luminescent coating, and gold Royal Oak hands with luminescent coating , self-winding Audemars Piguet Calibre 3120 movement with date and large seconds, approximately 60 hours of power reserve, stainless steel bracelet. Water resistant to 50 meters. The Audemars Piguet Swiss Watch Company was started in 1874 by two 21 year olds: Jules Louis Audemars and Edward Auguste Piguet and today their headquarters are located in their hometown of Le Brassus, Switzerland. The AP movements were so accurate and desired that their competition such as Cartier, Tiffany & Co. and Bulgari re-branded and sold Audemars Piguet watches under their own brand names. In 1928 Audemars designed and released the world’s first skeleton watch. Today Audemars Piguet produces approximately 26,000 luxury Swiss timepieces annually and they have a variety of features including Self-winding, Day & Date, Dual Time, Chronograph, Perpetual Calendar, Equation of Time, Tourbillon, Tourbillon Chronograph, Grand Complication and Leo Messi. Materials that AP uses during production include: stainless steel, 2 tone, 18K rose, yellow and white gold, forged carbon, ceramic, titanium, platinum, diamonds and straps are made from crocodile or rubber. These are the 2015-2016 wristwatch collection models: Jules Audemars Men, Millenary Lady, Pocket-Watch Grande Complication, Royal Oak Chronograph, Royal Oak Offshore, Tradition Extra-Thin. 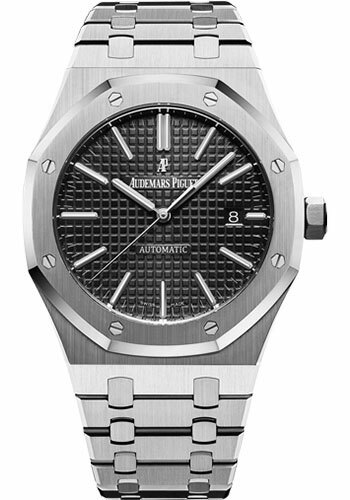 Audemars Piguet has teamed with celebrity ambassadors, including: Stanislas Wawrinka, Sachin Tendulkar, Michael Schumacher, Lionel Messi, Sebastien Buemi, LeBron James, Michelle Yeoh, Serena Williams, Rory McElroy, Arnold Schwarzenegger, Nick Flado, Miguel Angel Jimenez and Lee Westwood. SwissLuxury.Com sells authentic AP watches at great discount sale prices and our clients enjoy the strong masculine cases featured on the Audemars Piguet signature watch styles.